For the 2018 version of the Chemainus Bluegrass Extravaganza, we were very happy to present Jesse Cobb and Border Ride. 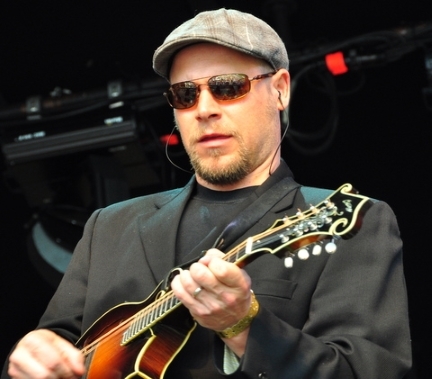 Wisconsin native Jesse Cobb was a founding member of The Infamous Stringdusters, a Nashville-based powerhouse touring group. With The Dusters, Jesse received a Grammy nomination for his original song Magic #9. He has also recorded on a Grammy-winning project, and has won three International Bluegrass Music Awards. Along with Jesse, Border Ride also includes Virginia-born Jeff Ellis, a world-champion bassist. Over the years Jeff has played with several notable bands, including David Parmley and Continental Divide, and Marty Raybon and Full Circle. But the talent does not stop there, the band also features Miriam Sostenes on the fiddle. Miriam discovered fiddle music while finishing up a classical music degree. She has spent the last ten years performing and teaching the instrument. With her band The Sweet Lowdown, Miriam has toured extensivlely in North America and Europe. Also included in this wonderful group is Mike Kraft, who has long been a mainstay on the Vancouver Island bluegrass scene. Mike's showmanship, humour and enthusiasm for performing make him a real crowd favourite. Rounding out this amazing band is Garrett Tompson. Garrett's parents introduced him to an array of music styles, but it was bluegrass music that ultimately made the biggest impact on him. He provides true lead bluegrass vocals, along with strong rythym guitar playing. 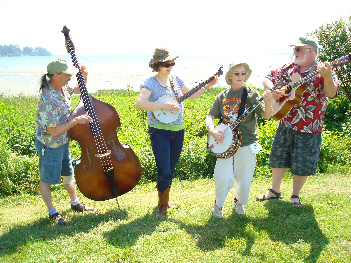 The Clover Point Drifters are a bluegrass band from Victoria, BC. 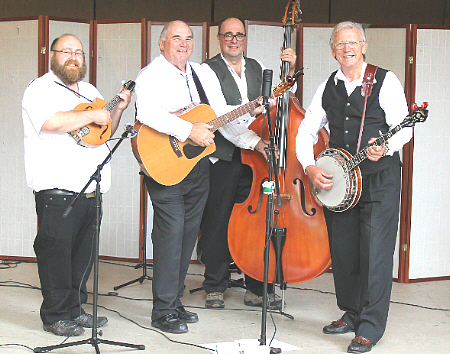 Their repertoire consists primarily of traditional bluegrass songs, with a sprinkling of country, folk, blues and pop melodies served up in the bluegrass style. 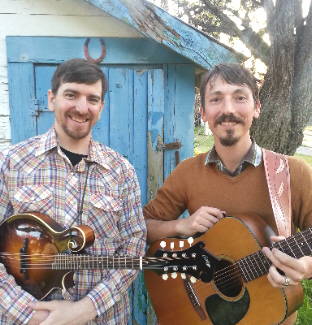 Their songs feature close heartfelt duet and trio harmonies, backed by strong banjo, dobro and mandolin accompaniment. The band takes its name from a magnificent point of land that overlooks the Strait of Juan de Fuca near "Mile Zero" in Beacon Hill Park, the first marker on a trek from Canada's west coast to the east. 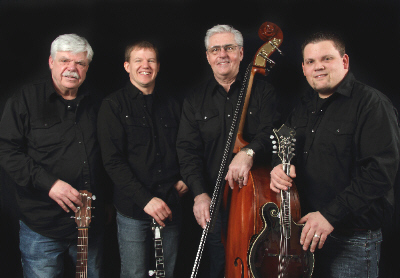 The Riverside Bluegrass Band consists of Eric Adams, Steve Harperson, Angus MacKenzie and Tad Ruszel. The band is an extraordinary group of talented, energetic and exciting musicians. We are certain everyone will enjoy this fresh new sound! Tad Ruszel’s inspirational lyrics and heart-warming guitar melodies have been catching the ear and enthusiasm of thousands across the northwest coast. Jeff Dill (guitarist, harmony and lead vocalist) joined Riverside in May 2016, adding his rhythmic groove and lead stylings to the group. Backing up these talented musicians with hard-driving bass, Eric Adams has been on the bluegrass scene for over thirty years. Gold Heart!To headline the 2017 show, we managed to get Gold Heart to come and visit us from Virginia. The band is made up of the Gold sisters (Tori - mandolin & vocals, Jocey - guitar & vocals, Shelby - fiddle & vocals) with their father Trent on double bass, and brother Kai on banjo. Their award-winning instrumental ability and their accomplished, harmony-laden vocals are sweetly unique and rootsy. Here's a video of the band from 2015 - CLICK HERE. We also be featured a lot more great bands. Here's one you love, it's Scout Mountain, from Powell River. 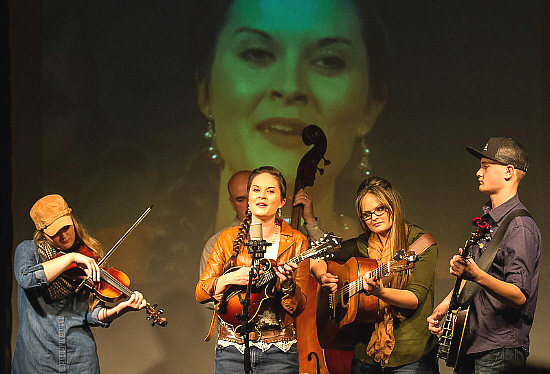 This five-piece band came together to do traditional bluegrass music, and they do it with with lots of harmony. The 2017 festival's host band was once again Bluegrass Fever, a band that is always highly appreciated by the crowd. 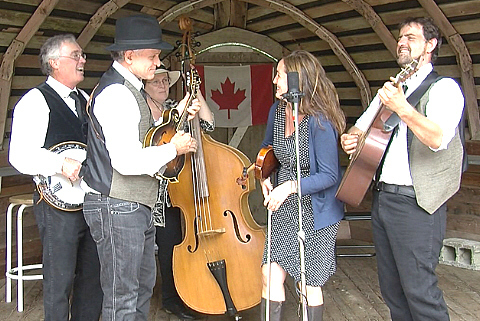 The 5 ON A STRING band was founded in September 1989, and the band's home base is Vancouver, British Columbia. We've always leaned toward traditional bluegrass with some original tunes and the occasional foray into old style country music like Merle Haggard and sometimes even Fats Domino! 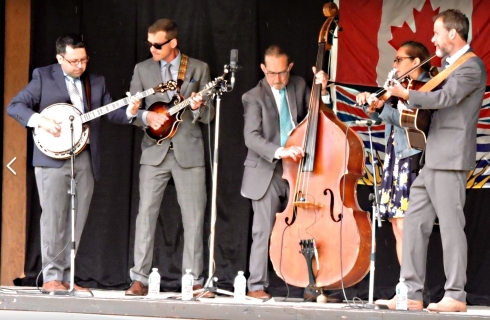 Since '89 the band has played many of the Northwest's major bluegrass festivals such as: Granville Island, Mt St. Helen's [Toledo, WA], Chilliwack, Salmon Arm, Prince George, Coombs, Kamloops, Burns Lake, Sorrento, Shady Grove [Nanton, AB], Blueberry [Stony Plain, AB], Canadian Rockies [Nordegg, AB. 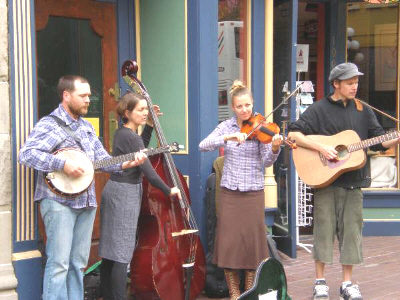 ], Darrington [WA], Wintergrass [Seattle], Folklife [Seattle], The Straight Bluegrass Festival [Port Angeles, WA. ], and the Cottonwood Festival [Fort St. James]. 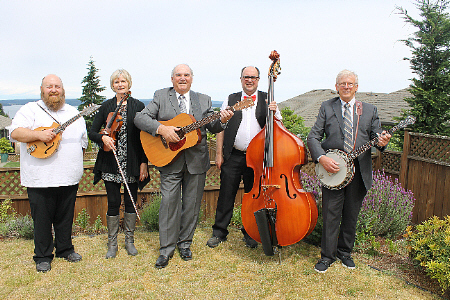 The band members have instructed at various bluegrass workshops, particularly the BC Bluegrass Workshop in Sorrento, and the Cabin Fever Bluegrass Workshops in 108 mile House, B.C. For more information, visit www.5onastring.com. 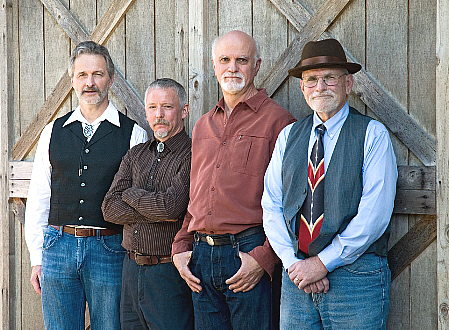 Jim Faddis, Cort Armstrong, Rick Meade and John Pyles collaborate in FarmStrong, an acoustic quartet that puts singing at the forefront of their sound. A very simple and distinctive instrumentation accompanies the band's smooth vocal sound and brings the songs they perform to life. Like a fine whiskey, FarmStrong's sound is pure distilled country magic. FarmStrong lights up the stage with exquisite harmony signing and seasoned instrumentation. The heart of the band draws on inspiration from the last century of country, blues and bluegrass music from the 1920's through the 50's, as well as folk, rock, gospel and soul music of the 50's, 60's, 70's and beyond. 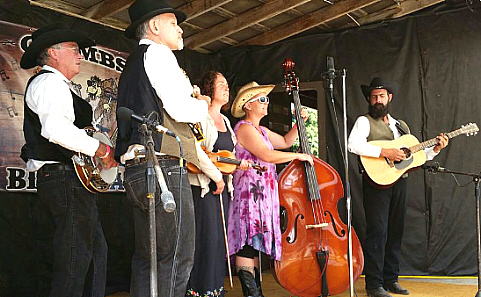 FarmStrong's talented and experienced musicians take their audience outside the bluegrass tradition. Their unmistakable sound moves the soul, while remaining firmly rooted in music from the mountains. More info at http://farmstrongmusic.com/. 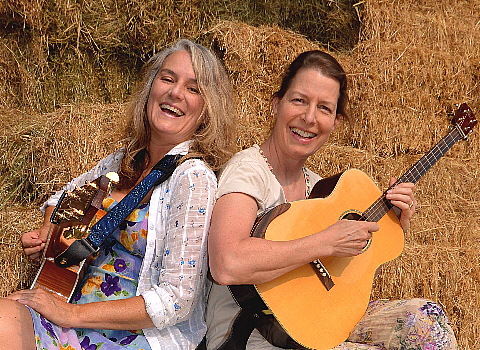 Shelley Brown and Tamara Phelan, two women from different backgrounds, born in different countries come together through their mutual love of music as the Song Sisters. Shelley Brown, an accomplished musician best known for her work as a bass player and singer in everything from bluegrass bands to electrified alt-country endeavours now puts her keen sense of timing to good use as a rhythm guitar player for the duo. Tamara Phelan, a prolific songwriter of exceptional talent, singer and reformed multi-instrumentalist plays the tenor guitar, giving the Song Sisters a clean simple sound that perfectly accentuates the vocal harmonies. 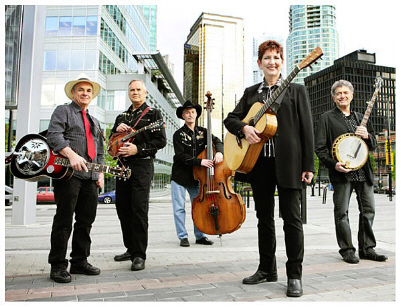 BLUEGRASS FEVER is based on Vancouver Island and plays traditional, modern and original bluegrass music. 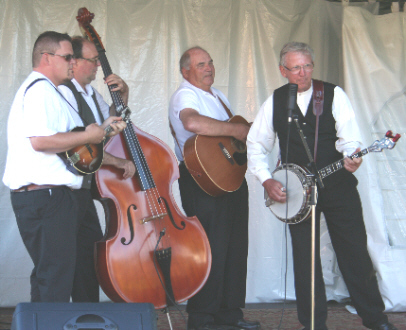 Bluegrass Fever has developed a solid reputation as one of the most crowd-pleasing bluegrass bands. Over the past few years, the boys have become the host band for this festival. 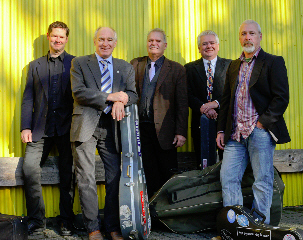 Banjo wizard Barrie Hemmings (of the band's original 1989 line-up) moved to Victoria, and joined forces with guitarist Bob Johns--known on the Island for his years with the popular Back Forty Boys. Guy Langlois is a highly talented upright bassist from Port Alberni. The mandoin player is Steve Bastian, of Crofton. Originally from Okotoks, Alberta, Steve provides great lead breaks, as well as a solid mandolin chop. The band was happy to recruit Steve for the job. The latest addition to the band is Jan Norton, from Victoria. 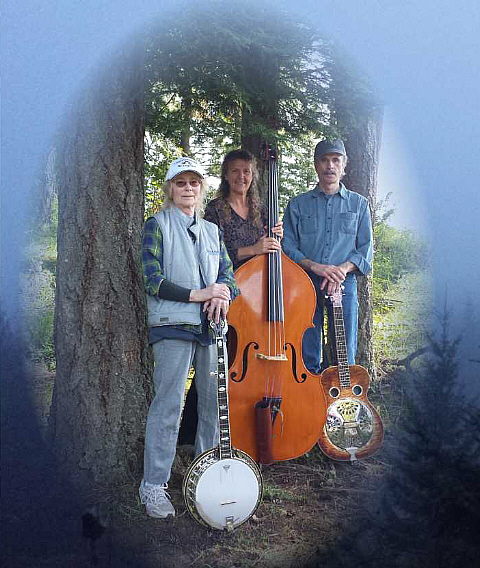 Jan plays a wonderful bluegrass fiddle, and adds some lovely vocal harmonies. With the rough waters of the Pacific around them and the wilds of the Canadian North above them, The Sweet Lowdown have developed original acoustic roots music that draws from earth and sky. This is mountain music to be sure: mountains tied to the natural environment of the Pacific Northwest. As such, you'll hear influences in this music as far-ranging as Celtic jigs, Appalachian fiddling, contemporary pop and that particularly Canadian blend of driving tradition and ground-breaking originality. Fresh off a tour with CBC's Vinyl Cafe, and quickly gaining critical acclaim for their newest release "Chasing The Sun" (produced by Adrian Dolan of The Bills, Ruth Moody Band), The Sweet Lowdown have accomplished much in the past 5 years. Their self-titled debut album (2011) was nominated for "Album of The Year" at the Vancouver Island Music Awards, and their second album "May" won "Island Roots Album of the Year", at the VIMA's. 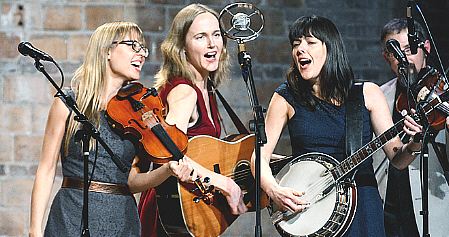 It also earned the trio a nomination for "Vocal Group of the Year" at the 2013 Canadian Folk Music Awards. 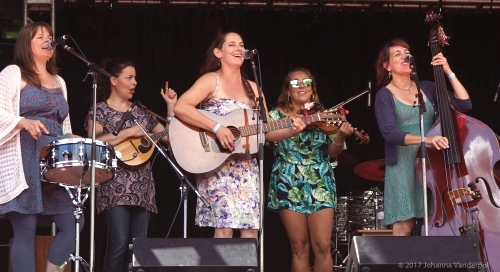 The Sweet Lowdown have toured throughout North America and the UK, and have taught their love of roots music and harmony singing at camps and workshops across Canada. Scout Mountain is nestled in Wildwood, true story, west of Powell Lake on the Sunshine Coast of British Columbia. 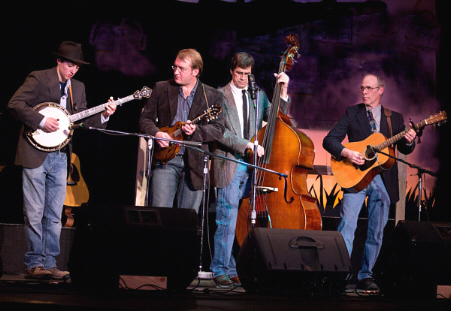 Our 5-piece band came together in 2009 to do traditional bluegrass music. We like to use a single mic on stage and so far the reception has been fantastic. We find inspiration in all kinds of music, while constantly tryng to bring it all back to the clean and high lonesome sounds of the early days of bluegrass. We hope our new website will help you get to know us, our music is all about having fun, and meeting other bluegrass music lovers. So if you see us out at a show, or on a bluegrass festival site be sure to say hi, and drop by our campsite, and most likely we'll feel a tune coming on. Traditional bluegrass music with lots of harmony, greatly inspired by the stylings of Doyle Lawson, but we also have a large range of artists we look up to as we develop our own sound. Jr Sisk, Tony Rice, Joe Val, Del McCoury, Jim and Jesse, The Louvin Brothers, the Stanley Brothers, and of course Bill Monroe, Flatt and Scruggs, well yes the list goes on and on. Immersed in the traditional bluegrass canon, the Hub City Ramblers bring their own thoroughly modern west coast sound to the table. 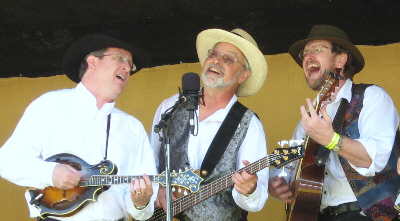 Their repertoire typically consists of traditional, old time songs and instrumentals, and their own uniquely crafted originals with some hints of jazz and rock 'n roll influences. Although each member is a Vancouver Island University Music alumni, Hub City Ramblers is made up of a truly unique band of individuals from diverse backgrounds coming together for the love of acoustic folk music. The personel are (from left to right in the accompanying photograph): Ira Pelletier, Brad Shipley, Marisha Devoin and Duncan Symonds. For more information about the band, visit http://hubcityramblers.weebly.com. Banjo wizard Barrie Hemmings (of the band's original 1989 line-up) moved to Victoria, and joined forces with guitarist Bob Johns--known on the Island for his years with the popular Back Forty Boys. Guy Langlois is a highly talented upright bassist from Yellowknife, NWT. The latest addition to the band is the mandoin player, Steve Bastian, of Crofton. Originally from Okotoks, Alberta, Steve provides great lead breaks, as well as a solid mandolin chop. The band was happy to recruit Steve for the job. 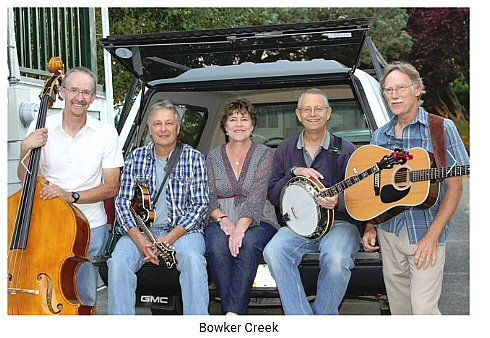 Since forming in 2009, Bowker Creek has entertained audiences throughout southern Vancouver Island with its own brand of bluegrass fusion that combines country, folk, blues and bluegrass. Bowker Creek performs original compositions as well as rearrangements of familiar and less familiar tunes from a wide range of artists and genres. 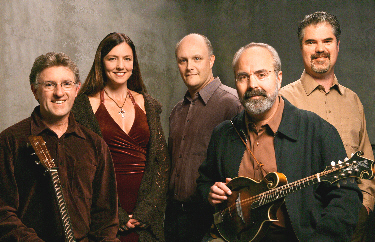 Members of the band include Doug Van Dine (banjo), Dan Ready (guitar and mandolin), Bonnie Duncan (vocals, guitar and harmonica), Martin Matychuk (stand up bass), and Duncan Sutherland (guitar and vocals). For more information, please see www.reverbnation.com/bowkercreek. 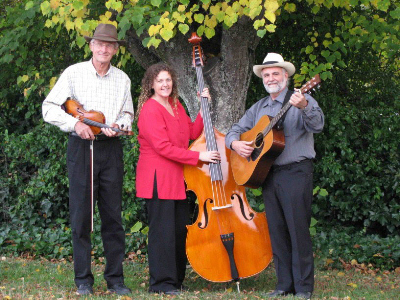 Linda Thorburn (banjo) has played in numerous bluegrass bands over the 36 years of her playing career. Luann Burton (bass with lead vocals and harmonies) was introduced to Bluegrass music in 2001. She started playing fiddle then realized she wanted to sing. She taught herself basic bluegrass rhythm guitar chords, and has written several songs. She has been playing bass since 2007. The band is joined by Mike (Boomer) Boyd on guitar and vocals. Boomer is well-known in bluegrass circles, and will add a lot to the band with his fine guitar-playing and powerful vocals. STEEP RAVINE visited from the San Francisco Bay area. Trampin' On, the band's new album of originals, showcases Steep Ravine's musical prowess, blending melodic verse, tight harmonies, and rich instrumentals. The diverse musical backgrounds of the band mates are featured, which encompass classical, jazz, and funk. 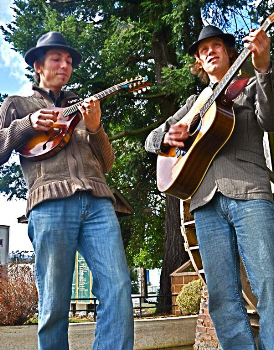 Guitarist and lead vocalist Simon Linsteadt and violinist Jan Purat began playing music together in high school and later moved on to study music at UC Santa Cruz, where they fortuitously met mandolinist Andy O'Brien and bassist Alex Bice. Trampin' On was recorded on two-inch tape at an analog recording studio in San Francisco. With the Fall 2013 release of the album, Steep Ravine embarked on a national tour, with shows in Los Angeles, San Diego, Phoenix, Tucson, Silver City, New Orleans, St. Louis, Columbia, Denver, Colorado Springs, Missoula, Seattle, Portland, Eugene, and many points in between. The band's riveting live performances catch audiences by surprise with the sheer acoustic power of their collaborative sound, a mix of soulful tunes and fiery instrumentals. 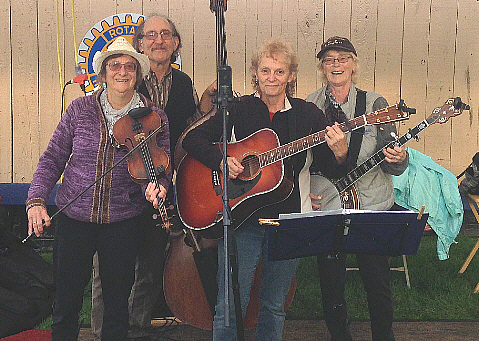 The 5 ON A STRING band was founded in September 1989, and our home base is Vancouver, British Columbia. We've always leaned toward traditional bluegrass with some original tunes and the occasional foray into old style country music like Merle Haggard and sometimes even Fats Domino! For the past 10 years, the TISHOMINGO STRING BAND has been treating Vancouver audiences to their own brand of high energy acoustic music. Featuring Jacob Russell on mandolin, Colin Cowan on upright bass, Chris Russell on guitar and Devon Wells on banjo, the group performs original and traditional material that runs the gamut from tender ballads to barn burning instrumentals. 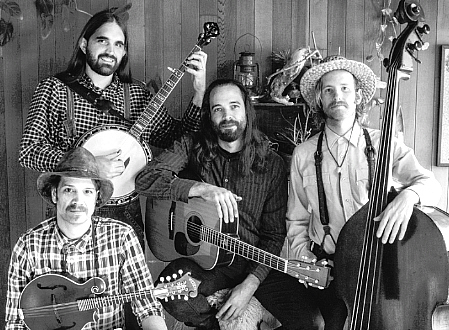 Combining the drive of classic bluegrass with a notion to explore, the Tishomingo String Band keeps things lively and unpredictable. You really are going to have to listen to this band yourselves to appreciate their amazing sound. 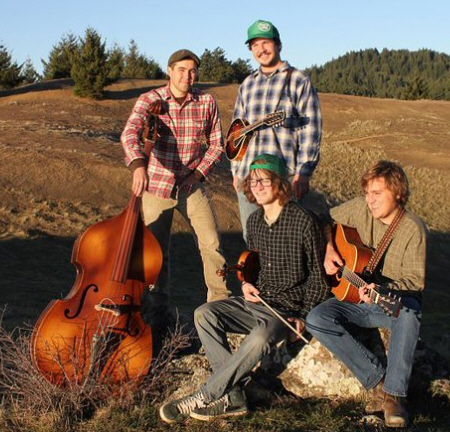 To hear a little of the band playing some ragtime bluegrass, Click Here, for a sample of their amazing nusical abilities. 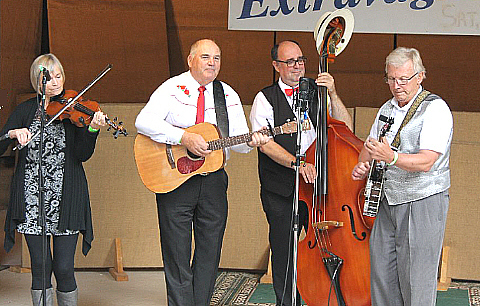 In 2014, we brought a little old-time country music to the festival. 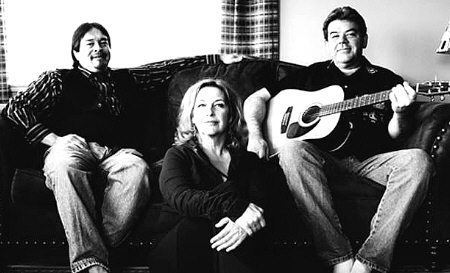 THE MOON RIDERS will be here, featuring the amazing voice of Sharon Dudka, with well-known Vancouver Island guitarist Gord Bigham, and Blaine Bartleman on upright bass. The band played one set on Sunday afternoon at last year's festival, and they proved to be very popular. So this year, they are in for both days of the festival. We think that you'll just love them! 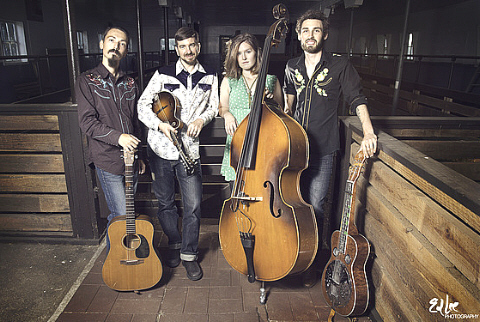 The members of Highrise Lonesome are city dwellers steeped in the classic sounds of bluegrass. Although they may make brief detours off into the side streets of old-time and roots music, they always return to the bluegrass superhighway. Sparkling vocals are a major part of the sound, with the harmonies of Sue Malcolm and Vic Smyth as the centrepiece. The band features classic-sounding originals and innovative covers, showcasing instrumental prowess with innovative arrangements. It's a bluegrass road trip. The Hub City Ramblers band is the latest offering from mandolin ace Ira Pelletier, of Nanaimo. Ira's show was extremely popular when he last played at our festival a couple of years ago, and we're happy to have him back. Apart from Ira's wizardry on the mandolin, the Hub City Ramblers will be showing-off their wonderful "brother-style" harmonies. 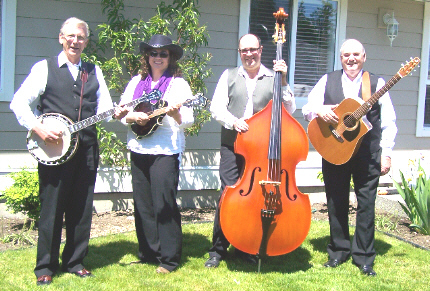 BLUEGRASS FEVER is based on Vancouver Island and plays traditional, modern and original bluegrass music. 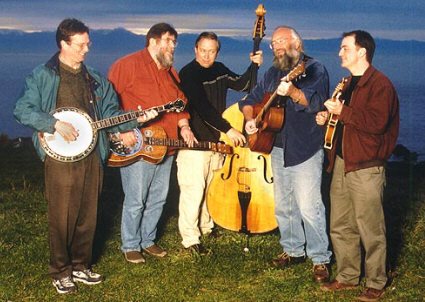 Bluegrass Fever has developed a solid reputation as one of the most crowd-pleasing bluegrass bands. Runaway Train was here, visiting from the United States. The band features four great musicians, including the award-winning, 17-year-old banjoist Luke Dewhirst. The band originally formed over ten years ago, evolving into the energetic quartet it is today. Characterized by strong leads, tight vocal harmonies and solid instrumental work, the group performs at festivals, concerts and private events. The group has a compelling, traditional, driving sound, and is not afraid to stretch the limits of the genre! 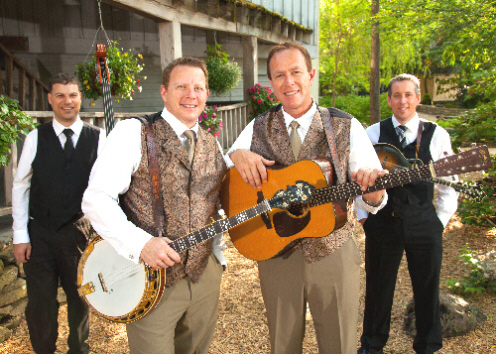 These boys offer sweet, smooth harmonies in the best of the Bluegrass Tradition. Bryon Clayton Thomas blends their distinct instrumental sound with a purity of voice for a finely tuned musical experience that turns any audience into fans, wherever they play. Flash In The Pan continues the quest to keep their name ironic. The band has been able to refine their sound during regular appearances around Victoria and Vancouver Island since Autumn of 2008. Audiences should gear up for another year of FITP's foot stompin' dance tunes and sweet four-part harmonies. Featuring new original songs and old favourites, their performances exude youthful energy and a love of bluegrass, old-time, country and gospel. The band's lineup includes familiar faces from the Victoria bluegrass scene: Miriam Sonstenes on fiddle (Backyard String Band, The Sweet Lowdown, Sweet Ginger), Cluny Macpherson on banjo (The Dougs, Neckbeard, Rock Island Ramblers), Kelly Sherwin on bass (The Balkan Babes,Ain't Dead Yet), Jeff Dill on guitar (Sweet Ginger, the Yiddish Columbia State Orchestra), and Chris Herbst on dobro (The Gruff, The Boot Screefers, Skagway) Visit www.myspace.com/finthep.